It reminded me of an article I had read in Wool Gathering by The Hamilton Wool and Craft Guild. So I dug out my copy and read it again. It inspired me to pull out the needles and a fleece and experiment. I found it a slow way to knit, as I had to stop to draft out the fibres. Pre drafting the fleece would speed up the knitting. I found it harder to get an even gist when drafting fibre for knitting with the 5.5mm needles. It was surprisingly easy to draft evenly when knitting with the 2.5mm needles. 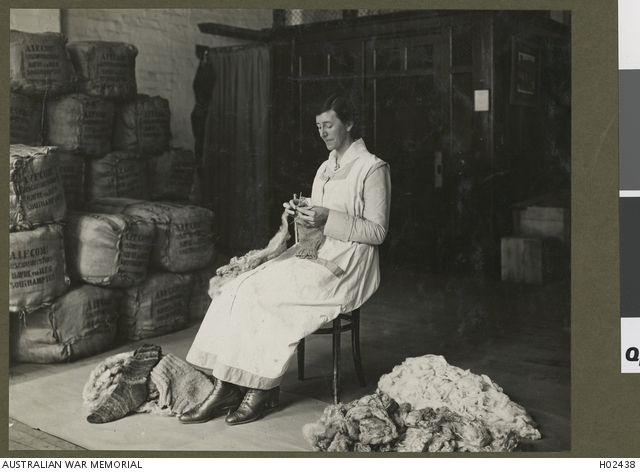 The photo from the War Memorial suggests the fleece Miss Coll is knitting with is unwashed. The lanolin in the fleece would of made the socks water proof. Water proof socks would of been advantageous in the trenches. If you are inspired to give this a go, please let me know how you go and send me some photos.